Where I live (unfortunately) visiting and home teaching was rare, especially if a member was not in the right cliques of the ward, nor a member of the Mormon country club in the community......in other words, deemed not worthy of anything by any member who was better. The ministering program is utter BS. The current LDS leaders are idiots and are not in tune with God. What makes you feel that the old HT/VT approach was greatly superior to the current system? Looks like you're having a difficult experience where you are. Sorry it's so painful, wherever you are. But it also sounds like there's an attitude regarding others that might add to the difficulty. Have you always felt so negatively about your church leaders or is this a recent thing? I hope you'll be able to see the good in them. There are some really great men and women among them. 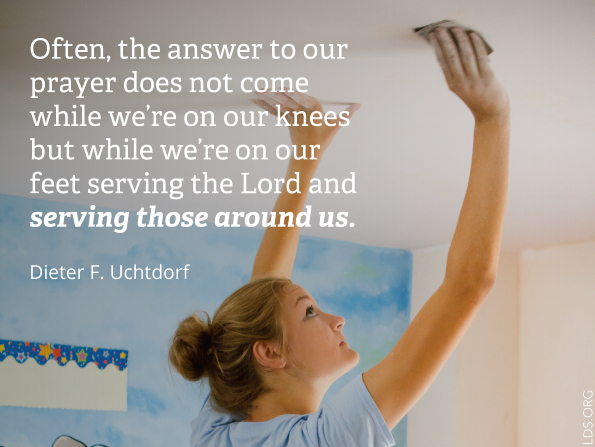 "There are some really great men and women among [church leaders]." One of them just got excommunicated. My goodness, Anonymous sure has an attitude problem; but he/she/it can take that up with the Lord later. Thanks for sharing your insights about Ministering. When it was announced I felt like the leaders were just explaining better and giving more focus to what HT & VT was always supposed to be, which is building relationships and ministering to the families or individuals under our watchcare. The thought that came to me when this new focus was announced: "This is going to lead to Zion!" Ask any EQP how they feel about this new program. It doesn't get done, and it's not going to get done, and it's going to peter out and disappear soon. Nice try, fellas! Wow, Anon @12:00, you must know many thousands of Elder Quorum Presidents. Cool. But for some reason, the ones I know seem to be a lot more positive about the change. The main struggle, though, seems to be getting comfortable with the new terminology. Anonymous, that's actually your job to make home teaching and now ministering work for you and those you are assigned to, not your leaders job. Leaders are there to help and serve you. If they don't understand that, don't worry about it, and just ask God for inspiration to know how to help those in your ward regardless of how they react to it. Don't make there problems your own. Just do the best you can. You have the ability to learn for yourself through personal revelation that what you have been asked to do is right. Pray about it sincerely and ask for guidance and help. If nothing else, you can improve yourself by learning from the experience, and ve bless for at least attempting to be there for others.